One of my calculus students earned a perfect score on this week's exam! So I made a present to hand back with her test. I hope she likes the sine function. The design is a remake of eduardoviruena's f(t)=sin t model on Thingiverse. 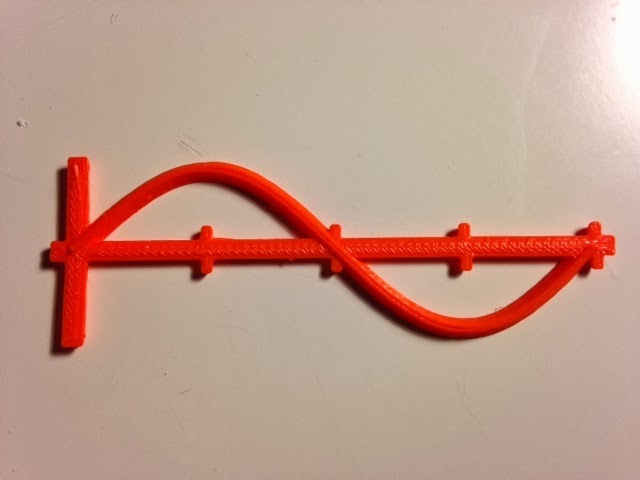 I couldn't get that model to slice and print correctly, and the only part of it that would import into Tinkercad was the curve. So I remade the axes and also flattened the bottom and top of the curve. Settings: MakerWare "standard" in 6 minutes, on the glass.